I am beginning to wonder this very question myself. The comment was prompted by the fact that I had received an e-mail newsletter from Musana Children’s Home in Uganda, where I spent the month of June. My week in Haiti brought up so many memories of that trip. The other exciting connection between these two experiences is that the newsletter outlined all the building projects that have taken place and been completed in the months since I left Musana… new verandas for the cabins, a beautiful new church, a dining area, a kitchen and more. To hear of how these things have come together so quickly gives hope for the process that has begun at the Children of Israel Orphanage in Torbeck, Haiti. In this all though, I agree with my friend, that my heart can quickly become divided…and even broken. Not only would I still rather be in the WARM weather wearing a skirt in Haiti, I would love to still be there loving on those children, twisting wires on the cabin that they will one day live in, learning new words in Creole in order to better be able to share the love of Christ with them. 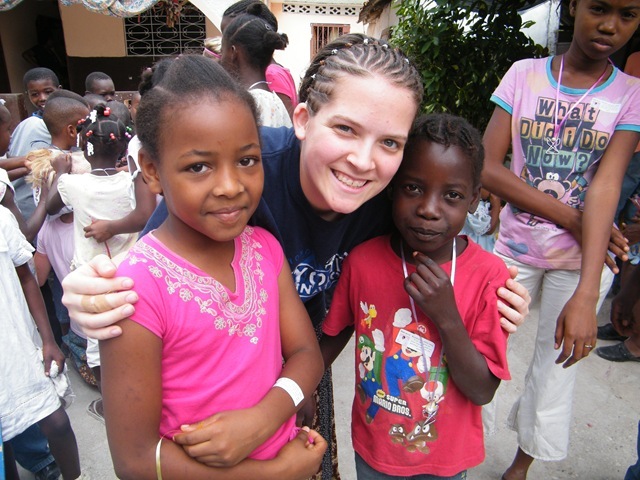 Yes, a portion of my heart remains today in Haiti. And a portion of my heart still remains in Uganda. And a portion of my heart is in Seward NE and Wichita KS and at camp and more. "One morning I was reading the story of Jesus feeding the five thousand. The disciples could find only five loaves of bread and two fishes. ‘Let me have them,’ said Jesus. He asked for all. He took them, said the blessing, and broke them before he gave them out. I remembered what a chapel speaker, Ruth Stull of Peru, had said: ‘If my life is broken when given to Jesus, it is because pieces of me will feed a multitude, while a loaf will satisfy only a little lad.’"
THAT is where wholeness is found… in seeking the One and only truth and walking in His way. Teach me that Way, O Lord! Back in June, God’s Way took me to Africa. This past week, that Way took me to Haiti… and yes, those beautiful children in both places stole a little piece of my heart. Today, though, God’s Way brings me back to New York. When my prayer is to have an undivided heart, focused on Christ, I can rest in knowing that no matter how many places I leave pieces my heart, as I take each step in the the direction of God’s way, my heart will become more and more whole.